Are you looking for a sewing machine packed with features that simplify your projects? Then you have come to the right place. Computerized sewing machines are easy to use and packed with features. They also come at many price-points so they don’t have to cost you a fortune. These machines have changed sewing forever. Unlike a manual machine, computerized machines contain small computers that control many motors that move the needle so that you can get more advanced stitching patterns. You can do this with the simple push of a button. The computer also stores dozens or sometimes hundreds of stitching or embroidery patterns and many machines also have the ability to download other stitches and sewing patterns from the internet. This is just scratching the surface. With these machines the possibilities are endless! Are Computerized Sewing Machines Suitable for Beginners? One of the things that I love most about these sewing machines is how easy they are to use. Most include functions that make sewing a breeze. Auto-needle threading, auto-stitch tension, auto-reverse, speed controls, powerful feed dogs and so much more. The only thing to keep in mind is if you beginner is very young or gets overwhelmed easily, a manual sewing machine will be more suitable. They have less features and will be far less overwhelming that the feature-rich computerized machines. Below I review a number of sewing machines that I have had a chance to test and play with. There are so many great machines out there in this category right now that the choice of which one to purchase can be a little overwhelming. To help, I have sorted my reviews starting with my favorite value machine and ending with the most expensive machine. Enjoy! If you are looking for an inexpensive machine, the Brother CS6000i is one of my favorites. 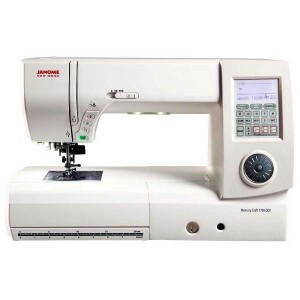 It is not only inexpensive, but has tons of features like the 60 built-in stitches, 7 button holes, variable speed control as well as many other accessories. It may come with a lot of features, but is still a great machine for a beginner. If you want to learn more, I have written a more detailed review of it here. However, if you don’t mind spending a bit more money or are a more avid user, then you are better off getting the Janome 8077 mentioned in the next review due to it’s higher quality and ease of use. 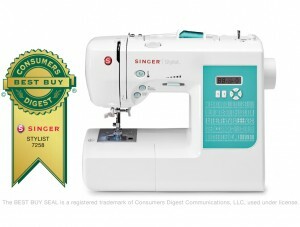 The Singer Stylist 7258 is an award winning 100 stitch machine that is a perfect machine for beginners and intermediate users. This machine is also very inexpensive; around the same price as the also excellent Brother CS6000i. However, if you want a machine that you can grow into, then the Singer 7258 is a much better choice. This machine is my first choice for those looking to get the best value for their money. The Janome 8077 is a perfect intermediate machine that is light, portable and runs very quiet. It comes with 30 stitches and six different button holes. This machine lives up to Janome’s reputation of quality. This sewing machine has just enough bells as whistles to help you grow, but not so many that you will be overwhelmed. It isn’t just for the intermediate user either; a beginner could grow on this machine because of its ease of use. The 8077 is another nice computerized sewing machine that you really can’t go wrong with. If you don’t want a ton of bells and whistles or stitches and portability is important to you then this machine is an excellent choice. The Janome 7330 Magnolia is a step up from the 8077 reviewed earlier and is the most advanced sewing machine in Janome’s Magnolia line. 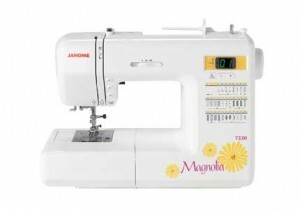 The Magnolia line is a great set of machines, made for beginners that are popular and are very high quality. This machine is definitely a great option for beginners, but it is such a powerful, fast and reliable machine that it is suitable for intermediate users as well. It is also a really pretty machine that will be sure to catch your eye as you walk into the room. This is an amazing intermediate sewing machine that you will be sure to love. This is a machine I own and love. You can read my more in depth review here. 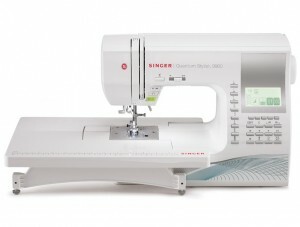 The Singer Quantum Stylist is another really good sewing machine. It comes with 600 stitches, 13 button holes and 5 different fonts. One of the nicest things that I found about this machine is the size of the workspace. If you like to create quilts or work with larger sewing projects then you will enjoy the extra-wide extension table. Beginners will feel like professionals on this machine. It is easy to set up, with automatic threading and bobbin winding. The sewing options available on the 9960 will have you finishing high quality sewing projects in no time. It runs also like a dream and is very solidly built. This is a great machine for those looking for a professional sewing machine, but don’t want to break the bank. If you are looking for the absolute best machine then look no further than the Janome 7700 QCP Sewing and Quilting Machine. This is my favorite machine and I really can’t say enough good things about it. It comes with 250 different stitches, 33 button holes, 3 monogram fonts, has an 11 x 4.7 inch workspace and so much more! I use this machine on a daily basis and am soooooo happy with my purchase. You can read my full review of this machine here. This is good for beginners for like me. I just read your reviews on both the heavy duty and computerized machines. While I like the Singer 9960, I also would like the ability to sew on heavier fabrics like denim and do dome reinforcing of straps on horse blankets which are heavy and have webbing straps. Can you recommend a machine that will do both? Thanks! Have you looked at the Janome HD3000? 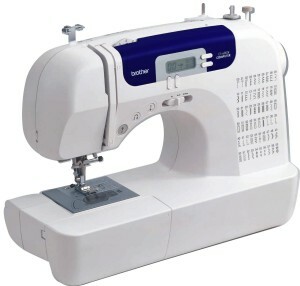 It is a really good home heavy duty sewing machine that is inexpensive and should be able to handle the stitching that you require. You can read my review here. What are your thoughts on buying a used one? I really want a computerized but 200ish dollars isn’t that affordable to me and I have no sewing instincts but I am better with electronics…??? If you can get someone who knows sewing machines to test it before you buy it, then you will have a better chance of finding a decent machine. I’ve bought used ones before and have only had an issue once. Computerized machines can be expensive to fix so you will want to get someone who is comfortable with sewing machines to try it out for you. Not sure where to start a new question so I will ask here. I just finished 8 lessons in quilting and just love it. I was sewing on an old singer and know I need a new machine . At first I was looking at very expensive machine then decided to wait and do some research before buying. I only need a machine for making quilts so I may not need such a high end machine like Pfaff, Babylock or Janome but there are certain features that I want in it. When I see one that is reasonable like the Singer Plus One there is a feature missing like the automatic thread cutter also would like to have a machine that come with a 1/4 in foot. Would you know any machine that come with all the features of the Singer Plus One and with the extra that I want, I find it very overwhelming with all the machine that are on the market. Thank you very much for the feedback. I think what you are looking for may be the Singer Quantum Stylist. It has similar features to the Singer One Plus and a 1/4 inch foot. You can find more information here. Thank you for your reviews. I’m looking into getting a new machine & it’s overwhelming! What do you think about Singer One Plus? I’m also considering Janome 7330 & Sinegr Quantum 9960. I consider myself an intermediate sewist. I think all three of those machines are great choices. It really depends on what features you want. I’ve always been a bit more partial to Janome sewing machines, so if I was choosing for myself I would go with the Janome 7330. It doesn’t have all the bells and whistles of the other two, but they tend to be more reliable. If you want all the features then the Singer One Plus would be a great choice. I have read in very many blogs that the jenome hd3000 is one of the best machines for heavy fabric and i am considering buying it. However. i would love to have a heavy duty machine with a lot more sewing patterns and MOST IMPORTANTLY speed control. What do you recommend? 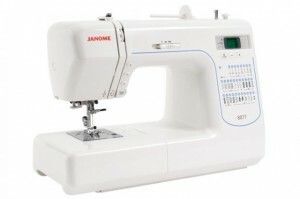 If you want a quality heavy duty sewing machine many stitch options I would recommend the Janome 6300. It is an amazing machine. You can find it here. Thank you for your reviews. I live in South Africa and we only have 3 Janome sewing machines available and the only one worth looking at would be the 8077. If I want anything better I will have to purchase an Elna but I will pay for the name. The comparison I am looking at is the Elna 520, which cost R9,999 and the Janome 8077, R3,700 – such a bug price difference but I believe the machines are made in the same factory. We can also buy Singers and Berninas, the latter again is frightfully expensive. In the Singer I can get the Brilliance 6199 but honestly it is all very confusing. I wanted a computerised machine, which can handle heavy fabrics, like denim and has some features that will make sewing a pleasure – I am going on a Pattern Making and Design course. I currently own a little Elna machine but it is very basic, only has 20 stitches and honestly the needle breaks if I sew thicker fabrics. Africa also seems to be a little behind, we don’t have the latest. The Magnolia Janome machine you mentioned is not available here yet. I would love any suggestions please. I would like a recommendation for a machine that I can operate in Australia 240 volt power. Also, which one is going to be more economical to service, repair and buy accessories. Would like to post a note on buying a used or refurbished sewing machines. First, we ask, does it run? Yes, the electricity feeds in, lights up, and you go from there. A scrap of fabric, thread, new needles, bobbinin and…go! It may do so for a while. The big question, is does it sew? Does it sew well? And for how long? Because it can run, but with wear, over time and use, the timing will be off and it will not really sew. With enough wear, on many different parts, all add up to throwing the timing off. This can be fiddled with for a while, but in the end: it runs but does not sew well. Yes, many old used machines run, but they do not sew. Know the difference between running and sewing.